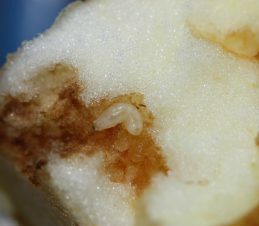 The apple maggot is active from early June to late September. The maggot overwinters as pupae in the soil. Adult flies emerge in late spring and begin to lay eggs just under the apple skin. The eggs hatch, and the larvae begin to tunnel through the fruit. When mature, the maggots leaves through a small opening made in the side of the fruit and enter the soil. The apple maggot has only one generation a year. Eggs are laid singly just under the skin and hatch in 3 to 7 days. Up to 200 eggs can be laid by a female over its 2 to 4-week lifespan. Larvae are white, legless, maggot-like with no distinct head, and get to be about 6.5-8 mm long when mature. They burrow through the fruit before maturing in 13 to 50 days, depending on the temperature. Mature larvae leave the fruit once it has fallen and burrow into the soil over winter. Larvae in unharvested fruit in the fall are not likely to survive the winter. Pupa are about 5 mm long, gold to brown colour, oval shape. The larvae enter the soil to a depth of 2-5 cm, usually beneath the host plant, where pupation occurs. Pupae stay dormant over winter, and they may persist in the soil for several years. Adults are about 5 mm long, black body with yellowish head and legs, and green eyes. Wings have black bands, easily recognizable by four irregular or zig-zag black bands on the wings. 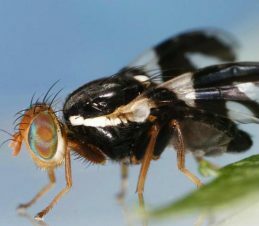 Adult flies begin to emerge in late June and early July, and will continue to emerge until early October. Adults require 7 to 10 days to feed and mature in order to lay eggs. Females are attracted to ripening fruit to lay eggs and will move between host trees as the fruit ripens at different times.